Max Rivers (Cook) is an underground kickboxer with a drinking problem. His former girlfriend Susan (Lamatsch) is now with fellow kick-fighter Philip (Tartalia). When evil gangsters kidnap (or possibly kill) Philip, Susan runs back to her former love, Max, for help. Unfortunately, Max doesn’t realize the caliber of what he’s getting himself into, as this army of punks is led by the sinister fighter Don Carlio (Neilsen). Caught and imprisoned by Carlio, they force Max to fight for them in order to save Susan. Upon escaping their clutches, Max and Susan head out to the woods so Max can train for the final battle with Carlio. Will love and kickboxing prowess conquer all? Released by AIP but produced by Davian International, the company behind the majority of Dale “Apollo” Cook’s career, “Blood Ring” was directed by the infamous Teddy Page. Besides Cook, it also features Nick Nicholson, a man fast becoming a familiar face around the Comeuppance Reviews headquarters for his bad guy roles. Cook continues his penchant for pink and/or purple tank tops and shorts, while the cute Lamatsch has an extremely thick German accent which is never explained plot-wise. Neilsen isn’t much in the acting department but you can tell he’s a fighter in real life because his moves are well-executed. The plot all comes to a head with one of the bloodiest final fights in recent memory in a barbed wire ring and there’s even a pre-Mike Tyson ear bite. All told, Blood Ring is a decently entertaining movie that gets better as it goes along. Love Teddy Page trash movies! Make sure you check out that Phantom Soldiers I sent you if you haven't, another of his masterpieces. Teddy Page is awesome! He can do no wrong. We are about to watch Phantom Soldiers next week! We are very excited to see it. This looks like a good one, and another reminder that I need to get on the Dale Cook bandwagon sooner than later. Phantom Soldiers was a fun one and fairly brutal too. I'm also hoping to get my hands on a movie Page did with Karen Sheperd called Blood Chase. 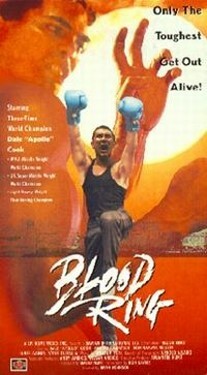 You gotta love American martial artists doing 80s Filipino action movies -- for my money, the combination can't be beat. Totally agree with you Karl! Blood Chase sounds cool. Hope you can find a copy!